A wealthy family tries--and fails--to seal themselves off from the chaos of post-World War II life surrounding them in this stunning novel by one of Germany's most important post-war writers. In East Prussia, January 1945, the German forces are in retreat and the Red Army is approaching. The von Globig family's manor house, the Georgenhof, is falling into disrepair. Auntie runs the estate as best she can since Eberhard von Globig, a special officer in the German army, went to war, leaving behind his beautiful but vague wife, Katharina, and her bookish twelve-year-old son, Peter. As the road fills with Germans fleeing the occupied territories, the Georgenhof begins to receive strange visitors--a Nazi violinist, a dissident painter, a Baltic baron, even a Jewish refugee. Yet in the main, life continues as banal, wondrous, and complicit as ever for the family, until their caution, their hedged bets, and their denial are answered by the wholly expected events they haven't allowed themselves to imagine. 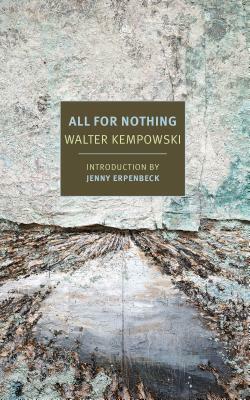 All for Nothing, published in 2006, was the last novel by Walter Kempowski, one of postwar Germany's most acclaimed and popular writers. Walter Kempowski (1929-2007) was born in Hamburg. During World War II, he was made to serve in a penalty unit of the Hitler Youth due to his association with the rebellious Swingjugend movement of jazz lovers, and he did not finish high school. After the war he settled in West Germany. On a 1948 visit to Rostock, his hometown, in East Germany, Walter, his brother Robert and their mother were arrested for espionage; a Soviet military tribunal sentenced him to twenty-five years in prison, of which he served eight at the notorious "Yellow Misery" prison in Bautzen. In 1957 he graduated high school. His first success as an author was the autobiographical novel Tadellöser & Wolff (1971), part of his acclaimed German Chronicle series of novels. In the 1980s he began work on an immense project, Echo Soundings, gathering firsthand accounts, diaries, letters, and memoirs of World War II, which he collated and curated into ten volumes published over twenty years, and which is considered a modern classic. Anthea Bell is the recipient of the 2009 Schlegel-Tieck Prize for her translation of Stefan Zweig's Burning Secret. In 2002 she won the Independent Foreign Fiction Prize and the Helen and Kurt Wolff Prize for her translation of W.G. Sebald's Austerlitz. Her translations of Zweig's novellas Confusion and Journey into the Pastare available as NYRB Classics. Jenny Erpenbeck was born in East Berlin in 1967. She is the author of several works of fiction, including The End of Days, which won the Hans Fallada Prize and the International Foreign Fiction Prize, and most recently, Go, Went, Gone. Erpenbeck lives in Berlin.